You can start marinating the tofu mixture a full day ahead. 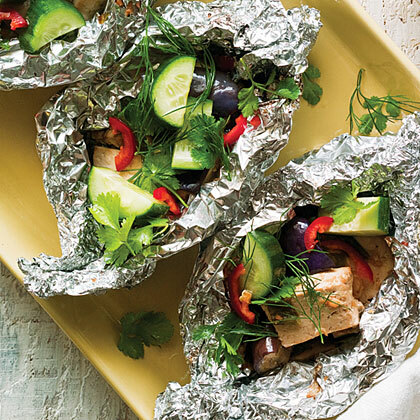 Make tofu and eggplant: Seal ingredients in a resealable plastic bag, turn, and chill at least 1 hour. Heat grill to high (450° to 550°; you can hold your hand 5 in. above cooking grate only 2 to 4 seconds). Divide tofu mixture among 4 large squares of foil and seal securely. Grill bundles, turning once, until eggplant is tender when pierced, about 10 minutes. Make salad: Mix all ingredients except rice and soy sauce. Unwrap bundles and top with salad. Serve with rice and soy sauce.